'Business Day' any day on which commercial banks in England are generally open for business. 'Business Hours' 9am to 5pm inclusive on any Business Day. 'Buyer' the person who accepts a quotation of the Seller for the sale of Goods or whose order for the Goods is accepted by the Seller. 'Claim' a complaint sent by means of a Notice to the Seller by the Buyer in relation to defects, shortages or non-delivery of the Goods, whether actual or alleged. 'Conditions' the standard terms and conditions of sale set out in this document. 'Consequential Loss' loss incurred by the Buyer or anyone else including but not limited to: loss of profits; loss of contracts; loss of goodwill; damage to reputation; damage to property belonging to the Buyer or to anyone else; personal injury to the Buyer or to anyone else (but only so far as such injury is not caused by the Seller’s negligence). 'Containers' all containers, supplied by the Seller including but not limited to kegs, casks and gas bottles/cylinders, cases, pallets and returnable bottles. 'Contract' any contract between the Seller and the Buyer to buy and sell Goods. 'Day' a period of twenty-four hours ending at 12 (twelve) midnight England time. 'Delivery Note' the document issued by the Seller to the Buyer with the Goods and which the Buyer must sign and hand to the carrier for return to the Seller confirming receipt of the goods. 'Equipment' any equipment supplied by the Seller to the Buyer, including but not limited to any of the following: dispense heads and taps, cellar connectors, cellar cooling equipment, refrigeration equipment, wine coolers, bottle cooling shelves or cabinets, or signs. 'Goods' the goods (including any instalment of the Goods or any parts of them) which the Seller supplies to the Buyer in accordance with these Conditions. 'Notice' a written document sent by either party to the other delivered in accordance with clause 15 of the Conditions. 'Order' a request from the Buyer to the Seller for the supply of Goods. 'Price List' the Seller’s wholesale price list from time to time in force. 'Requirement' any statutory or other legislative enactment, regulation or rule from time to time in force, issued by a governmental and/or a competent body relating to the sale and/or storage of the Goods by the Buyer. 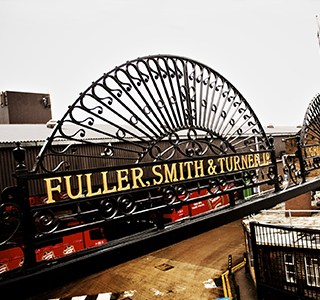 'Seller' Fuller Smith & Turner PLC, registered number 0241882, and any of its subsidiaries. 1.2. Clause headings are for convenience only and do not affect the interpretation or construction of these Conditions. 1.3. Any references in these Conditions to a person shall include an individual, partnership, unincorporated association, corporation, government or governmental subdivision or agency, business trust, estate, trust, or any other legal or commercial entity or undertaking whether acting in an individual, fiduciary or other capacity. 1.4. Unless the context otherwise requires, any reference in these Conditions to a party means either the Buyer or Seller and any such reference to parties shall be construed accordingly. 1.6. Any reference in these Conditions to any Requirement, statute or statutory provision shall include any amendment, enactment, re-enactment and any subordinate legislation made from time to time under that provision. 2.1. The parties agree to contract on the terms contained in these Conditions which shall prevail over any inconsistent terms which the Buyer may seek to introduce. 2.2. These Conditions together with the terms of the Order form the entire agreement between the Seller and the Buyer. Unless a written agreement is made to the contrary between the Buyer and Seller and signed by an authorised representative of the Seller, no other express terms, written or oral, shall be incorporated into any Contract. Save as otherwise provided in these Conditions, there is to be no variation of any Contract. 2.3.3. accept any offer or counter-offer made by the Buyer. 2.4. These Conditions may be amended by the Seller from time to time. The Conditions in force at the time of the acceptance of an Order shall apply to that Order. 2.5. The Order constitutes an offer by the Buyer to purchase Goods in accordance with these Conditions. The Buyer is responsible for ensuring that the terms of the Order are complete and accurate. A Contract shall be formed on acceptance of the Order by the Seller either by Notice or by conduct of the Seller. 3.1. Unless otherwise agreed between the parties, the price for Goods shall be that stated in the Price List on the date the Order is accepted by the Seller. All subsequent publications of the Price List supersede and take precedence over any previous or other Price Lists. 3.2. All prices quoted to the Buyer or contained in any Price List are correct at the time of publication only, but may be subject to an error, omission and other variation. In any event, the Seller reserves the right to refuse to accept an Order. 3.3. Unless otherwise stated, prices in any quotation or published in the Price List do not include VAT or any other taxes/duties, charges or fees for handling and/or delivering the Goods. 3.4. The Seller may, by giving Notice to the Buyer vary the price of the Goods at any time before delivery. 3.5. If the Seller incurs any additional costs (including storage charges) as a result of the Buyer’s neglect or default, the Buyer must pay those costs to the Seller in addition to the price agreed between the parties in accordance with the relevant Contract. 3.6.2. there are any currency fluctuations increasing the cost of raw materials, the Seller may adjust the price of the Goods to reflect such change. 4.1. The Seller is entitled to send an invoice to the Buyer for the price of the Goods plus VAT and any other taxes or duties, on or at any time after delivery of the Goods. 4.2.3. payment for the Goods shall be due from the Buyer 7 days from the date on the relevant invoice. 4.3. The Seller may at any time require the Buyer to pay for Goods in advance by way of cleared funds or by any other method of payment the Seller may specify to the Buyer. 4.4.8. exercise any of the Seller’s rights under clause 6. 4.5. The Buyer shall be obliged to pay all VAT and other rates, duties or taxes that may be applicable to the sale of the Goods, in addition to the Price, and such sums shall be payable in addition to the Price, and the payment obligations and rights in this clause 4 shall apply to such sums. 5.1. Delivery of the Goods will be by or on behalf of the Seller, unless otherwise agreed. 5.2. The Goods may be delivered in advance of any date quoted to the Buyer and upon the Seller giving Notice to the Buyer. 5.3. All Goods shall be delivered to the location set out in the Order, or if no location is set out in the Order, the Buyer’s address, if known to the Seller. 5.4. The Seller shall not be liable for late or failed delivery where such delay or failure results from the Buyer’s improper or unclear instructions. 5.5. Delivery is deemed to take place when the Seller (or carrier) hands over to the Buyer a Delivery Note authorising the Buyer to receive and/or collect the Goods. 5.6. The Seller reserves the right to make delivery of the Goods by instalments and to tender a separate invoice in respect of each instalment, in which event, each delivery shall constitute a separate Contract. 5.7. If the Seller delivers one or more instalments which do not correspond with the terms of the Contract, the Buyer may not treat this as a reason for terminating the Contract as a whole, and the Buyer’s remedy shall be limited to a claim for damages. 5.8. Any delivery dates mentioned in any quotation, Order or other document supplied to the Buyer by the Seller are approximate and time shall not be of the essence for delivery. 5.9.3. withhold payment of any part of the price set out in the Contract or otherwise agreed between the parties. 5.10. The Seller reserves the right to deliver up to 10% (ten per cent) more or less than the quantity of Goods ordered by the Buyer, and where there is a variance of quantity, the total price payable for the Goods will be amended pro rata. 5.11.2. re-sell the Goods to any other person at the best price readily available and (after deducting all reasonable storage, insurance and selling expenses incurred by the Seller) charge the Buyer for any shortfall below the price as set out in the Contract or as otherwise agreed between the parties. 6.1.2. the Buyer sells the Goods to another person, in which event ownership in the Goods shall pass to the Buyer immediately before the Goods are delivered to that other person. 6.2. Where the Goods are in the Buyer’s possession or control, and are attached to or incorporated into other goods, (whether supplied by the Seller or by any other person) or are altered in any way, ownership in the Goods does not pass to the Buyer by virtue of that attachment, incorporation or alteration. 6.4.2. where the Buyer has not yet received the Proceeds, the Seller may, by serving a Notice on the Buyer, require the Buyer to assign to the Seller the Buyer’s right to recover the price for any Goods which have been re-sold to any other person. 6.5.2. the Seller may, by giving Notice to the Buyer, prohibit or restrict the Buyer’s right to re-sell the Goods to any other person. 6.6.3. verifying the shelf-life and quality of the Goods being stored by the Buyer. 6.7. Risk in the Goods passes to the Buyer on delivery in accordance with clause 5. The Buyer must insure the Goods against all insurable risks for the price due to the Seller for the Goods. 6.8. If the Goods are destroyed by an insurable risk before the Buyer has paid for the Goods, the Buyer shall hold the proceeds of payment under the relevant insurance policy on trust for the Seller as payment for the Goods. (f) the Buyer's financial position deteriorates to such an extent that in the Seller's opinion the Buyer's capability to adequately fulfil its obligations under the Contract has been placed in jeopardy. 7.2.3. the relevant provisions of clause 6 will apply. 8.1.2. be of satisfactory quality (within the meaning of the Sale of Goods Act 1979). 8.2. The Buyer shall, before signing and returning the Delivery Note to the carrier, carefully examine the Goods immediately upon receipt of the Goods and shall submit a Claim for any defects or shortages reasonably discoverable on careful examination of the Goods by 17:00 on Business Day after the date of delivery in accordance with clause 5. 8.3. Goods which are subject to a Claim in accordance with this clause shall be held in the Buyer’s safe custody and at the Buyer's risk and expense. The Buyer shall give the Seller a right of access on any Business Day during Business Hours to the place where the Goods are being kept so that the Seller can investigate the Buyer’s Claim. 8.4.2. the Seller has been given a reasonable opportunity to investigate the Buyer’s Claim. 8.5. The Seller is not obliged to process any Claim by the Seller which has not been made in accordance with this clause, in which event the Buyer may lose his entitlement to reject the Goods entirely, and may be obliged to make full payment of the price to the Seller. 8.6. Where the Goods have been used after the Buyer has become aware of a defect or shortage or in such circumstances which should reasonably have indicated to the Buyer that such a defect was present, the Seller shall not be liable for (and the Buyer shall indemnify the Seller in full for) any loss or damage the Seller or any other parties may sustain as a result of such defect in the Goods. 9.1. Where any valid Claim in respect of the Goods is based on any defect in the quality or condition of the Goods, or their failure to meet the specification as set out in the Contract, or as otherwise agreed between the parties, the Seller shall be entitled to replace any of the Goods at no extra cost to the Buyer or, at the Seller’s sole discretion, to refund to the Buyer the price of the Goods (or the proportionate part of the price), but the Seller shall have no further liability to the Buyer. 9.2.5. any matter in respect of which it would be unlawful for the Seller to exclude or restrict liability. 9.3.3. the Seller's total liability to the Buyer in respect of all other losses arising under or in connection with the Contract, whether in contract, tort (including negligence), breach of statutory duty, or otherwise, shall in no circumstances exceed £1,000.000 (one million GBP). 9.4. The Buyer shall at all times use its best endeavours to mitigate any losses suffered as a result of any breach of the Contract by the Seller. 9.5. Subject as expressly provided in these Conditions, all warranties, conditions and other terms implied by statute or any other legally enforceable rule or Requirement is excluded to the fullest extent permitted by law. The Seller shall not be liable for any failure to deliver the Goods arising from circumstances beyond the Seller’s control including, but not limited to, acts of God, war, riots, explosions, abnormal weather conditions, hurricanes, tornados, floods lightning strikes, storms, fires, government and/or industrial action, strikes, lockouts, delays due to suppliers, accidents, shortages of materials, mechanical and power failures, deficiencies in labour or any other manufacturing resources. 11.1. In this clause 11, “Goods Recall” means the recall or withdrawal of Goods or products that incorporate the Goods howsoever caused which are in the control or possession of the Buyer. 11.2. In the event of a Goods Recall, and if the Seller requires, the Buyer will enforce procedures (as notified at the time) covering the Goods Recall, and will cooperate with the Seller to ensure that the Goods Recall is dealt with promptly and effectively. 11.3. To ensure the safety of customers and the general public, the Buyer will immediately report to the Seller any defect or possible defect in the Goods which could require a Goods Recall. 11.4. If the Buyer is the subject of a request, court order or other directive of a governmental or regulatory authority to withdraw any Goods from the market (“Recall Notice”) the Buyer shall immediately send a Notice informing the Seller of the same, such Notice to enclose a copy of the Recall Notice. 11.5.2. destroy the recalled Goods and provide a certificate of destruction. 11.6. Except to the extent required by law and as otherwise set out in these Conditions, the Seller shall not be liable for any further costs or charges as a consequence of the Goods Recall. 11.7. The Buyer may not publish any notices or press releases associated with a Goods Recall, without the prior written consent of an authorised representative of the Seller. 11.8. The Buyer shall maintain a proper and efficient procedure for reporting and dealing with complaints but shall not settle any complaint or otherwise compromise our position thereto without the prior written consent of the Seller. Full details of all such complaints must be referred to the Seller by Notice upon receipt of the same. Notification must include the packaging and/ or batch code of the relevant Goods, without which no complaint shall be considered. The Seller reserves the right to seek trade and other references from time to time about the Buyer. 13.1. All Containers and Equipment at all times remain the property of the Seller. The Buyer shall upon receipt of a suitable Notice return to the Seller all Containers and Equipment within 7 Days of receipt of such notice. 13.2. The Buyer shall not sell, pledge, provide to any other person a lien or other proprietary and/or contractual right in relation to the Containers or Equipment, or otherwise deal with the Containers and Equipment in a manner inconsistent with the Seller’s ownership in them. 13.3. While the Containers and Equipment are in the Buyer’s possession or control, the Buyer shall be responsible for any loss and/or damage to them. 13.4. The Buyer shall, upon receipt of a Notice, pay to the Seller an amount specified in the Notice as a deposit in respect of the Containers and/or Equipment within 14 Days of receipt of such Notice. Such deposit will be refunded to the Buyer upon the safe receipt of the Containers and/or Equipment to the Seller (at a location decided by the Seller) provided that the Seller is satisfied that the Containers and/or Equipment returned are in substantially the same condition as that when the Containers and/or Equipment were provided to the Buyer. 13.5. The Buyer must, in any event, return the Containers and or Equipment to the Seller upon receipt of a suitable Notice from the Seller demanding the immediate return of the containers and/or equipment immediately upon receipt of such Notice. 13.6. In the event that the Buyer has not returned the Containers and/or Equipment in accordance with clause 13.4 above or have been returned late, the Buyer shall pay to the Seller such fee as specified in the relevant Notice issued by the Seller, demanding the return of the Containers and/or equipment. 13.7. The Buyer shall confirm that the Containers have been collected by the Seller by completing the relevant part of the Delivery Note accompanying the Goods which were delivered in those Containers. (b) kilderkin is 78.586 litres. 13.8.2. Containers are vessels used to carry beer and other beverages and in no way constitute quantitative measures. The Seller does not warrant that such vessels contain the dutiable volume or any other specific amount. 14.1. The Buyer shall abide by all Requirements. 14.2.1. the Buyer must offer to resell those Goods strictly in accordance with any instructions from the Seller (whether so marked on the Goods or not) and in accordance with any Requirements. 14.2.2. no credit shall be given by the Seller for Goods returned by the Buyer after the latest date of sale). 14.3. The Buyer shall at all times store Goods in the same Containers and Equipment supplied to the Buyer by the Seller and in accordance with any Requirements and any other specific instructions issued by the Seller by means of a Notice to the Buyer, issued from time to time. 14.4. The Equipment is supplied with the Goods by the Seller for exclusive use with the Goods, and the Buyer shall not use the Equipment for any other purpose. 14.5. The Buyer shall indemnify the Seller for any liability incurred in respect of any breach of this clause. 15.1. Subject to clause 15.2 any Notice given to a party under or in connection with these Conditions must be in writing and must be delivered by hand, pre-paid first-class post or other next working day delivery service at its registered office (if a company) or its principal place of business (in any other case). 15.2. In addition to the methods of delivery listed at clause 15.1 the Seller may give Notice under these Conditions by email to such email address as is specified from time to time by the Buyer. If no such address is specified then the Seller may use any email address which is customarily used to communicate with the Buyer. For the avoidance of doubt, the Buyer may not give Notice by email. 15.3.2. if sent by pre-paid first-class post or other next working day delivery service, at midday on the second Business Day after posting or at the time recorded by the delivery service. 15.3.3. if sent by email, at 9.00 am on the next Business Day after transmission. 15.4. Either party may inform the other of an address to which Notices may be delivered by notifying the other party in accordance with this clause 15. 15.5. This clause does not apply to the service of any proceedings or other documents in any legal action or, where applicable, any arbitration or other method of dispute resolution. The Buyer shall not be entitled to cancel the Contract except with the written consent of the Seller by means of an appropriate Notice to the Buyer, in which event, the Buyer shall pay to the Seller the sum of 10% of the price for the Goods, representing liquidated damages, to compensate the Seller for any loss incurred as a result of the cancellation. If any part of this Contract shall be held by any court of competent jurisdiction to be illegal or unenforceable, under any enactment or rule of law, such part shall be deemed severable and shall not form part of the Contract, but the validity and enforceability of the remainder of the Contract shall not be affected. 18.1. Any Contract entered into is strictly between the parties and the Buyer must not under any circumstances assign to any other person any rights arising from that Contract without the prior written consent of the Seller. 18.2. The Seller shall be entitled to assign or sub-contract the whole or part of the Seller’s obligations under any Contract between the parties without the Buyer’s prior consent. Any Contract and these Conditions, and any dispute or claim arising out of or in connection them shall be governed by and construed in accordance with English law and the Seller and Buyer agree to submit to the non-exclusive jurisdiction of the English courts as regards any claim or matter arising under any Contract entered into under these Conditions.